Anybody who knows me well will know that I have a major soft spot for House Industries, designers and purveyors of some of the finest typefaces and associated graphic-designery merchandise out there. Back in 2002, House released Christian Schwartz’s Neutraface, a family of fonts based on the architectural lettering specified by Richard Neutra in his gorgeous, modern architectural designs. It was epic. The type appeals to me on so many levels. In fact, architectural lettering was one of the factors most exciting to me about moving to Los Angeles several years ago. I even put together a small “photo essay” (I’m so pretentious) of local apartment building lettering examples. So let’s get one thing straight—I’m not knocking Neutraface. But it occurred to me yesterday when looking at my junk mail (the physical kind that arrives in your mail box) that Neutraface is now everywhere. It’s an epidemic. It’s managed to find its way into all sorts of unlikely and inappropriate places—in my opinion, it’s somehow jumped the gap from highbrow to lowbrow better than any of House’s fonts that were intended to be lowbrow, like their Street Van, bowling-inspired, and punk rock Flyer Fonts, among others. I find myself pointing and saying “there’s Neutraface!” several times a day to whomever may be beside me. I’ve even trained Don, my future father-in-law and three steps ahead account manager, to spot it on his own—and he sees it all over the place. As I say, it’s not always a bad thing to use Neutraface. 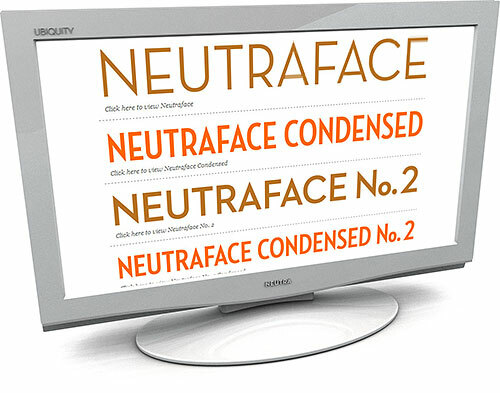 There are plenty of great examples of Neutraface in use on House’s website. I just feel like it’s becoming a bit indiscriminately used, like Helvetica. I wouldn’t even be surprised if the film Helvetica is partially responsible for Neutra’s more recent propagation—once you see just how populist a typeface has become, it’s almost embarassing to perpetuate it. But such is the case with all trends. When the bubble bursts, and enough time passes, and everybody else has moved on, it will again be cool to use Neutraface. And I’ll be waiting in vain for the moment to arrive. Am I just living in a Southern California Neutraface bubble, or are you also seeing it often in your neck of the woods? Feel free to comment. *Thank you to the unwitting Flickr folks I’ve quoted for taking these photos. What are some of your favourite fonts right now? Wow, good question. I’m all over the map, really! Depends on the situation and usage, I guess. Don’t get me wrong, though, I love Neutraface. It’s just everywhere. But lately I’m exploring a lot of more ’60s-ish stuff; been heavily inspired by the Photo-Lettering, Inc. Alphabet Thesaurus (see Recommended Reading on the sidebar), and the work of Erik Nitsche. I’ve posted about both of those elsewhere on this blog. I love Sudtipos’ Bluemlein scripts. And I think my favorites in general are sturdy-looking, hard-working Gothics. They’re so timeless and everyday, but they can be beautiful in a utilitarian way. As I say, all over the map. I recently used it for a company’s identity. So I’m in Utah and they’re usually a little late on the take from the coasts, but for what It’s worth, in the last 6 months. It’s everywhere here: some national stuff like village inn, but also like billboards for the local mall, candles, flyers, etc. Etc. Etc. I love the front and It’s getting pretty played out…It’s making me sad inside. same here in berlin. seems to be used on every second poster. kind of sad. My church started using Neutraface as our main font, and it was the first time I had seen, but now it really is everywhere. I hate it because i feel like it detracts from our branding (we DID have it first). Much like you say here, i see it multiple times a day. Strip malls, and restaurants are the main places i have seen it used. I can speak for Indiana and Washington – it is everywhere. I adopted Neutraface No. 2 as an alternative to Futura because that typeface had become so ubiquitous. Joke was on me, I guess. Even the newer seasons of Downton Abbey are using it on their DVD covers.